We are proud to introduce one of our staff workers, Maria Goyes! 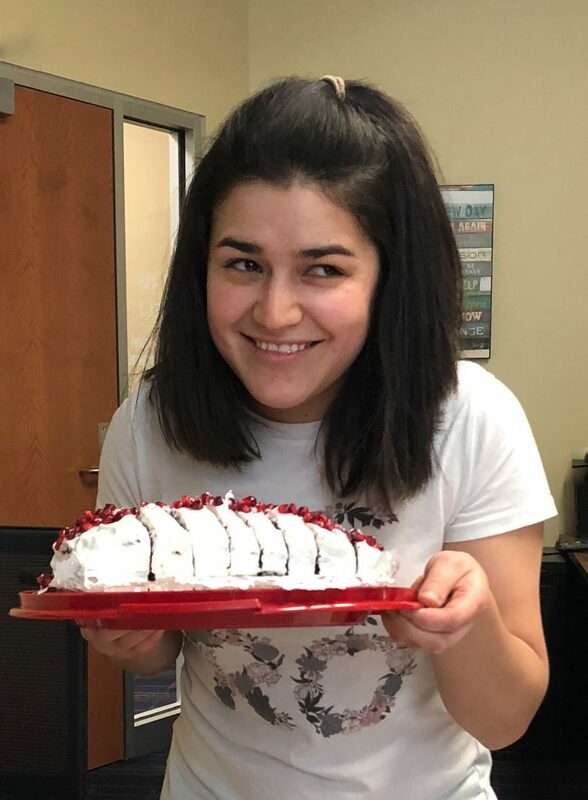 This fun, vivacious woman loves to welcome and interact with students and staff involved in our programs on top of performing office tasks in Special Programs at the English Language Institute. Originally from Ecuador, Maria came to the U.S. with her parents and two older brothers when she was 12 years old. She was tentatively diagnosed with Attention Deficit Disorder in Ecuador at 7 years of age. Later, she was diagnosed on the Autism spectrum with an intellectual disability in New York in 2006. Her family moved to Missouri in 2014, and she graduated that year from Kickapoo High School in Springfield, Missouri at the age of 18, not 21 like her family expected. Despite her diagnosis, she has amazed everyone with her progress and vibrant personality. Growing up, she found a passion for music and art. Today, she plays the drums and creates large canvas paintings. After graduation, Maria worked at Industrial Solutions for two years. Later, she also received support from Vocational Rehabilitation and Preferred Employment Services. Through Preferred Employment, she began working for our office in the fall of 2018. Since being here, we have all become so proud of her growth. She has been learning to read, write, and spell in both English and Spanish. She also has increased her focus and attention, speaks with more complete sentences, and has opened up in communicating with people. Plus, she is so happy to have a university ID. Overall, her job here has shaped her into a confident and mature woman who isn’t afraid to dream big. In addition to working with us at the ELI, Maria also volunteers at the Mercy Hospital cafeteria, Cox North day care, and Sacred Heart Church helping people of all ages. Wherever she is, Maria thrives in lighting up the room with her smile and jokes. She absolutely loves people and helping others. In the future, Maria desires to go to college and help in a classroom. By including Maria in what we do and who we are, we have given her a platform to become more visible. She has a bright personality, strong voice, and powerful story that we hope inspires you as much as it inspires us. She reminds us that we can be full of joy no matter what happens in life. We can have fun doing even simple tasks. And we always have the choice to set goals for ourselves and dream big. We would like to thank the Goyes family for their insight, support, and friendship in sharing their beautiful daughter with us at the English Language Institute.